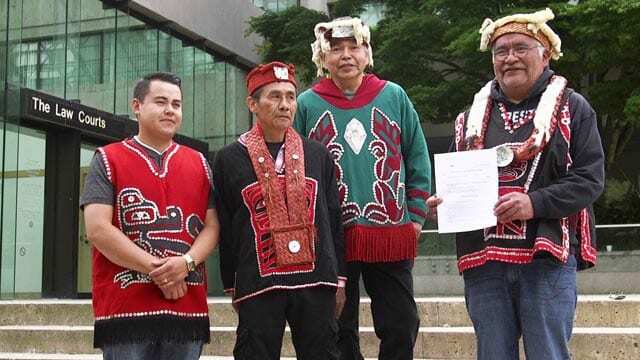 The Dzawada’enuxw First Nation of Kingcome Inlet filed a claim of Aboriginal title in British Columbia’s Supreme Court that affects ten fish farms in their traditional territory that they say are operating without their consent. “We have been saying no for 30 years,” says Lindsey Mae Willie of Dzawada’enuxw First Nation. “We have always said no and they just plunked themselves into our territory anyways. Jack Woodward, the nation’s lawyer, is a leading expert in Aboriginal law. Woodward represented the Tsilhqot’in Nation in the first successful claim of Aboriginal title in 2014. “Once a precedent is set the procedural barriers are largely eliminated,” says Woodward. “It’s very much like an icebreaker clearing a path through the ice. Although this new claim could take years to go through the courts, filing now puts added pressure on the provincial government, who has the power to grant fish farm tenures. Most of the ten fish farm tenures involved in the claim, along with others in the Broughton Archipelago, are up for renewal in three weeks. “Certainly one of the motivations is to file a claim prior to the June 20 expiry of the tenures,” says Woodward. “The Dzawada’enuxw want to clearly signal that they will not tolerate the renewal of those tenures. The Dzawada’enuxw believe that open-net fish farms pose a serious threat to wild salmon and have been actively protesting against the industry since last year. “We have tried everything we can to protect our salmon,” says Willie. “We’ve had marches, demonstrations, handed out eviction notices, we even occupied a fish farm, Midsummer Island, but got kicked off through an injunction last December. In early May, Marine Harvest Canada applied for an injunction that would prevent the public from coming within 20 metres of its 34 fish farm facilities on BC’s coast. The injunction hearing is adjourned to June 25. Greg McDade, the legal council for Morton, warns that Marine Harvest is trying to control the open ocean. “They are asking for something fish farms should not have the right to do,” says McDade. “Which is the ability to control the public at large, and scientists and divers, from observing while outside the pens. 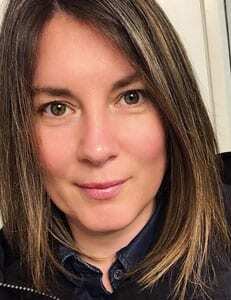 Molina Dawson, who grew up in Kingcome Inlet and occupied Midsummer Island fish farm for several months, says Marine Harvest’s desire to keep people away is concerning. Dawson is referring to underwater footage recently shot by Tavish Campbell. Tavish Campbell diving beside blood water spilling from fish processing plant. Courtesy Facebook Tavish Campbell. 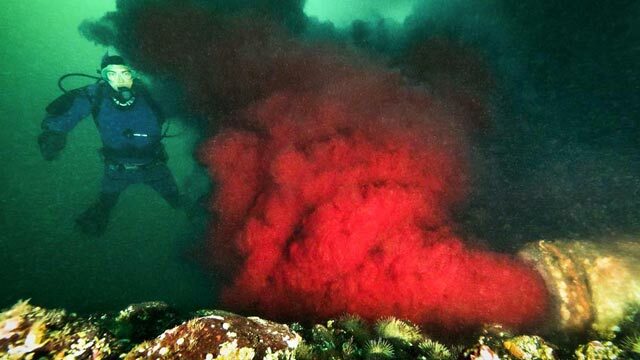 Campbell’s images of bloody effluent billowing from pipes at two fish processing plants off Vancouver Island went viral last November. And in April, Campbell’s footage of a rare glass sponge reef smothered by fish farm waste, owned by Cermaq Canada, was released. This month is a crucial time in the fish farm dispute. If First Nations opposed to salmon farms don’t come out on top, the Dzawada’enuxw are confident they will finally win the battle in their title case. As a fly-fishing angler, I have practiced my sport along the south western BC coastal beaches, for the past forty years. I have watched the rapid decline of salmon and sea-run cutthroat trout, especially within the last fifteen years. I have noted the same decline in in my native Ireland, Scotland and Norway, when open-net fish-farms were introduced in the early ’80’s. Regardless of claims made by the fish farming community, they contribute very little to our economy, while anglers like myself, who release 90% of our catch do, by our travel, accommodation and other expenses. The negative impact from fish farms cannot be underestimated.